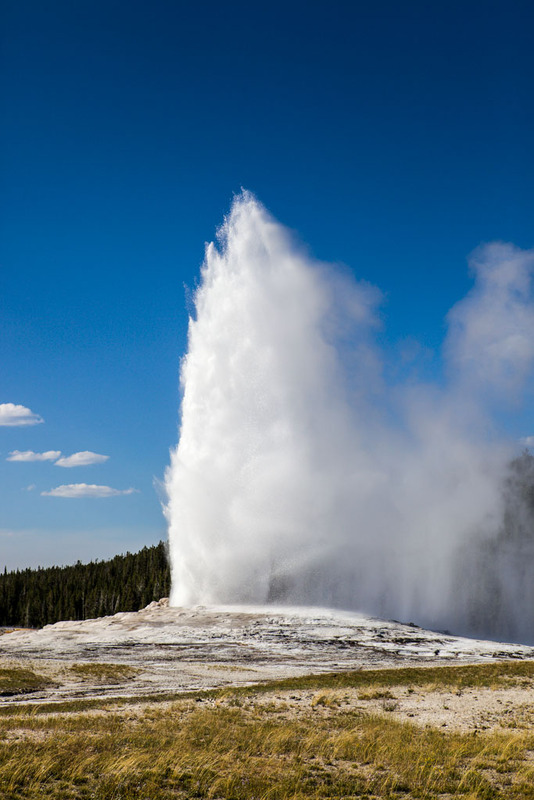 Sneezed On by Old Faithful! We visited Yellowstone’s Old Faithful geyser so often these past few months, we know the drill. First, we check the next “show time” at the Visitor Center which is pretty accurate within +/- ten minutes. Next, we jockey for a prime seat in the outdoor “theater”. Then, we wait, checking the time periodically, as the geyser teases us with false spews. Finally, a column of water shoots powerfully skyward to the delight and applause of the crowd. Simple. Or so I thought! This particular day, we took my sister, Kerri, and her family to the iconic geyser. It was a “standing-room-only” venue but that didn’t dampen our spirits. Kerri wanted to see geysers and I knew grand Old Faithful would deliver big! 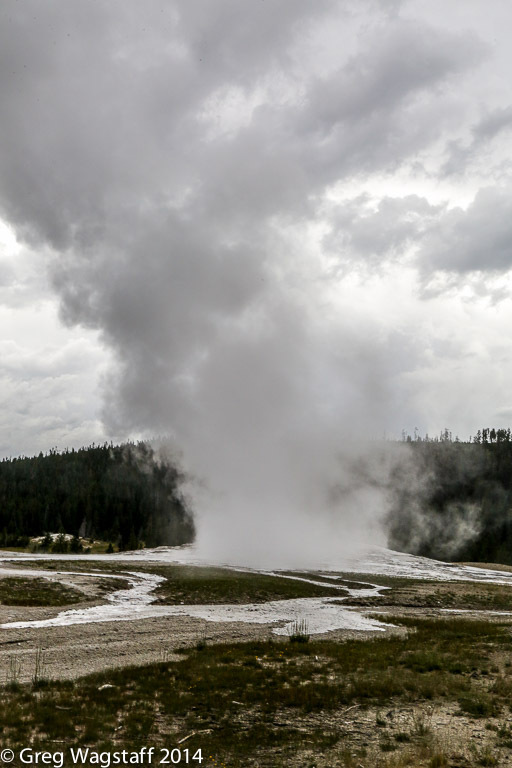 Just as it erupted, the wind charged towards the crowd blowing steamy water at us like water from a hose, obscuring all views of the geyser, sending tourists running towards the visitor center and dousing the faithful ones (that would be us!). Greg had only a moment to snap a photo and quick video before hiding his camera from the downpour. We stood, sopped and shivering. “What just happened! ?”, everyone asked. “Old Faithful just sneezed all over us!”, I exclaimed. Luckily, Brian, my brother-in-law, videoed the eruption from a different vantage point so at least Kerri got to see what it should have looked like! Lesson learned: Mother Nature has an unpredictable sense of humor! You guys see everything! Someday we will too!